When choosing how to screen in your porch, you have quite a few options. PVC is quite popular because of its affordability, durability, and temperature regulation capabilities. If you’re looking for PVC outdoor screen panels in Melbourne, the best place to get them is at Elite PVC. We are a locally owned and operated business that has been working in the industry for four years, and in that short time we have already installed a staggering number of high-quality outdoor screen panels. We provide a fantastic value for the cost and focus on ensuring that our customers’ satisfaction comes first. In addition to outdoor screen panels, we also specialise in bi-fold doors, Bi-fold WeatherwallsTM awnings and more. We personalise our service for each client, all the way from your free quote through to your installation. We provide ten-year warranties on our products, which come in a variety of styles and designs. All of our products are lightweight and maintenance free, much cheaper and safer than glass, and there aren’t any hidden fees associated with our service. We can help you colour coordinate with your current pergola or patio so that you don’t have to worry about your new outdoor screen panels in Melbourne looking out of place. If you have any questions or would like to learn more about our company or our product, we invite you to stop by our showroom or check out our website. 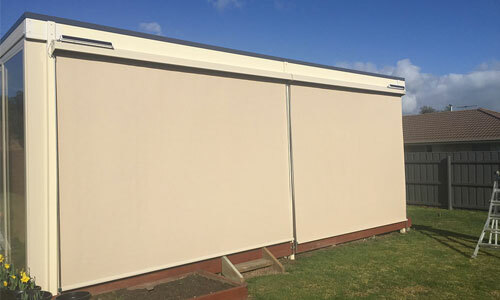 Elite PVC are some of Australia’s leading providers of outdoor screens, which are ideal for providing protection from the weather and enhancing the privacy of your home. Outdoor screens are especially popular among those who love to entertain at home, as they allow you to ensure the privacy and comfort of your guests, while letting you take in your beautiful natural surroundings with the clear PVC. Our outdoor and alfresco screens are some of the best on the market – find out for yourself by contacting our team today.